At last we can reveal the winners of our BrickHeadz competition! It was a very difficult competition to judge: we had around one thousand imaginative and creative entries featuring characters from films, TV, video games, history, music, cartoons and much more. To make it harder there were two categories, physical builds and digital entries. The judges considered the familiarity of the characters, likeness, originality, parts usage and presentation of the entries and whittled them down to two shortlists of 12. Then, the ten judges, including Marcos Bessa, senior designer of BrickHeadz at LEGO, picked their favourites from the lists. The Hanna-Barbera cartoon Wacky Races was essential viewing for anyone, including me, growing up in the 1970s. Lewis Smith‘s renditions of the show’s dastardly antagonist and his mutt are instantly recognisable and adorable. 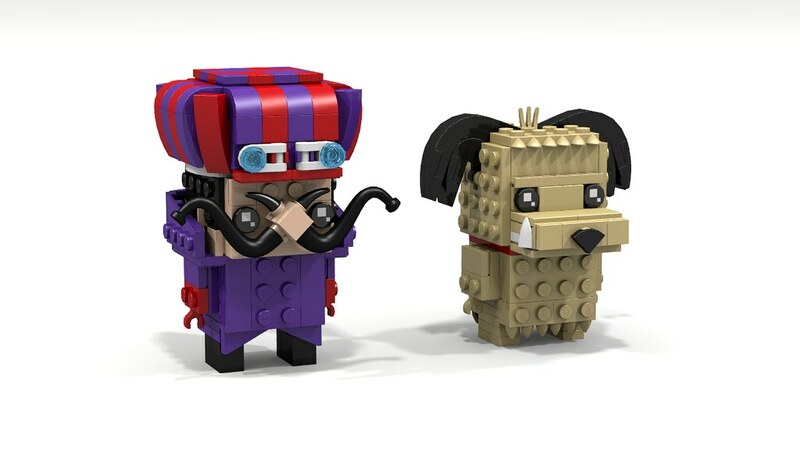 Dastardly’s moustache, eyebrows and racing goggles are particularly well modelled! It was great to see several entries based upon characters of LEGO’s own creation and this pair, consisting of Johnny Thunder and Doctor Kilroy from the late-1990s Adventurers sets, proved particularly popular with the judges. In fact, it received exactly the same score as that above so is in joint first place. The entry was posted on Instagram and looked so real at first glance that I had to ask mc_survival_man whether it was digital or physical! The models capture the likeness of the original characters very well. I particularly like the Doc’s sideburns and glasses, the latter of which are, I think, the only unavailable parts used, other than the tan 2×4 printed tile on the base. These Mogwai look deceptively cute and cuddly just like their screen counterparts! LEGO 7 has nailed the ears and faces and ably demonstrates pushing the boundaries of the core BrickHeadz design to suit the characters being modelled. These two heroes from Nintendo games incorporate some great parts usage. Both feature great ‘above the head’ features: nicely sculpted hair for Link and a signature hat for Mario. Mario’s mustache is simply built but looks perfect. This one is my particular favourite, and I don’t even like Queen! Krzysztof has bent the BrickHeadz rules a bit to get the arms so Freddie is able to hold his signature microphone stick and Brian his guitar but that’s perfectly fine. However, the stand-out feature is Brian’s 1980s perm which once again shows that what’s on top of a BrickHeadz head is key to creating an eye-catching model. Mr Brickman was on a roll for this competition and picks up third place, as well as first, with this pair of beasts from 1980s science-fiction films. He’s managed to model the distinctive curves of the Alien’s head and maintain its bio-mechanical look, all within the confines of the BrickHeadz rules. The Predator mignt not be as well known at H. R. Giger’s creation but it looks suitably menacing in BrickHeadz form! So, congratulations to the winners, thank you to everyone who entered and to the judges for taking the time to consider so many entries, which you can view on Flickr and Instagram. I’ll be in touch with the winners to arrange to get some LEGO shipped to you.